Thermaltake RIing 14 LED Fans are a 140mm fan fitted to enhance static pressure that produces impressive cooling performance with an optimized fan blade. Hydraulic bearings for silent operation guarantee ultra-low noise. In addition, an anti-vibration mounting system strengthens the stability during operation. The patented LED Ring maintains color and brightness uniformity; the lighting effect is visible from all sides and angles. The four-colored LED ring (in blue, red, white, and green) adds style to the chassis. These Thermaltake 140mm case fans come with Tt LCS certification, which means they meet the most rigorous design and performance standards, proving to be consistent and efficient. Equipped with Concentrated Compression Blade (CCB), wind blocker frame and hydraulic bearing, these fans ensure smooth and powerful performance. The CCB pressurizes and compresses the air outside and pulls out hot air from inside, ensuring optimum cooling for the case. This technology makes it ideal for devices that require high-static pressure. Its wind blocker frame combines with the blades to prevent the air from escaping and create a perfect compression effect in the middle section of the blade. Thanks to this mechanism, it considerably reduces the amount of noise and vibration. A self-contained fan controller can switch between 5 LED modes including solid colors of red, blue, white, green or disable and cycle through 256 colors. Play/Pause functions allow users to cycle colors (color remains unchanged even after the PC has been turned off or rebooted) with speed control options reduce noise even more all from your fingertips. The hydraulic bearing self-lubricates with a high quality, friction-reducing substance which lowers operating noise and improves efficiency. The seal cap prevents leakage of the lubricant, and improves the lifespan of the unit. By clicking the �SPEED� button on fan controller, the noise level can be reduced to 32%. 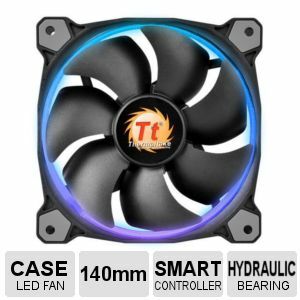 Buy this Thermaltake RIing 14 LED triple Fan pack now!